Photoshop Elements provides several methods for starting and exiting the program. You can open Photoshop Elements by using the Start menu or a desktop shortcut. When you want to exit the program, you can do so by using the Close button, the File menu, or a keyboard shortcut. To start Photoshop Elements 9 from the Windows Start menu, choose Start→All Programs→Adobe Photoshop Elements 9. 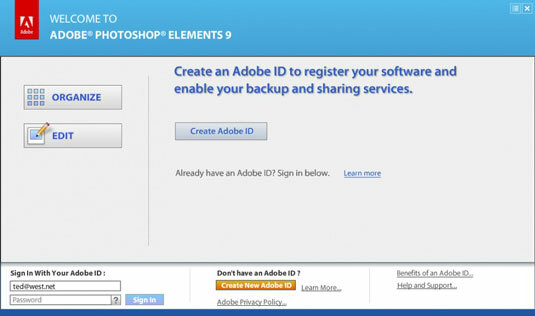 Alternatively, you can double-click the Adobe Photoshop Elements 9 desktop shortcut to start the program. Photoshop Elements displays a Welcome screen. The Welcome screen offers to open different editing modes and to help you start special Elements tasks. Organize: Click the Organize button to open the Organizer, where you can manage your collections of pictures stored on your hard drive. Edit: If you need to edit a photo, click the Edit button to access options for using either the Edit Quick mode to do some quick editing tasks or Edit Full mode, in which you can do the extraordinary editing jobs. Learn More (Windows): Click the Learn More button to get help information from Adobe’s Web site. The Photoshop Elements Welcome screen (Windows) appears when you launch Elements. If you know what you want to do in Elements, go ahead and click the appropriate button. But if you enter one mode and then decide you want to do something in another mode, Elements provides you the freedom to easily change modes from within the different workspaces. You can always return to the Welcome screen after you enter any editing mode. At the top of the Elements window in all modes, a house icon appears. Click this icon to open the Welcome screen again. Click the house icon on the menu bar in any editing mode to reopen the Welcome screen. Click the Close button (the X) in the upper-right corner of the Photoshop Elements window. If you try to exit Photoshop Elements 9 after editing an image and you haven’t saved your latest changes, the program displays an alert box asking whether you want to save your changes. To save your changes before exiting, click Yes. If you don’t want to save your changes, click No.